Once it reaches the tree top, the blade location has to be adjusted by pulling the rope in the necessary direction. It's called multi Tree Escalator can be used to climb not only coconut trees but also different types of trees with hands free to site and work, easy to transport in a small bag provided along with machine weights only 4.5 kg. D. Renganathan alias D.N. 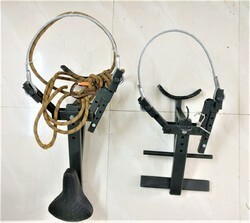 Venkat (49), an agriculturist from Coimbatore, Tamil Nadu has developed a coconut tree climber with a sitting arrangement, locking system and a safety belt.